We had a lovely restful day at Proserpine and while chatting with mum and dad for a while in the afternoon Neil played scrabble with another camper called Rhona who also had a lovely natured dog called Meg of whom Kouta decided to ignore all afternoon and just slept (like he normally does!). After Neil I played Rhona and in the evening we each had a game against her ... now Rhona is a serious player and plays in tournaments and although she says she is in the lowest grade for these tournaments she is still a very good player - and she had a 'lazy susan' type scrabble board, a timer (which we didn't use) and list of 2, 3 anf 4 letter words and a collins scrabble dictionary the weight of one of my food pannier when it is full! It was a cool night and all 3 of us got a good nights sleep after the previous nights storm - funny thing is the next morning after the storm everyone kept asking us if we got wet and they were most surprised when we said no - a backpackers van leaked so they had rain in the van, and believe it or not a caravan had rain water come through its' lights and a canvas tent had a bit of water but that was due to putting it up wrong in the first place and leaving a things up against it so water seeped through. It was cold in the morning but the sky was a clear blue and not a cloud in sight and it stayed like that for the rest of the day. It was a pleasant temperature to ride in - not too hot or cold. Our first 20km where flat and hardly a breeze to speak off. After the first 20km it became rolling but still ridable and with a wide shoulder. Just before we got to Bloomsbury we had a police car drive along on our side of the road going north and this forces all the cars of the road and he informed us that a wide load was coming - since both sides of the road was clear that meant a whopper was about to go through - I could barely hide my excitement! don't ask me why but I love looking at wide loads and when I the police person said it is 9m I told Neil to get the camera out! I have no idea what it is but it was great ... it is just amazing the size of some of the things you see - we are assuming it is for the mines somewhere around Collinsville. But it did take up both sides of the road - I can't wait to cycle through the mine roads! Fingers crossed we get to see more of this type of stuff! We took a cuppa after Bloomsbury and there was no where in the locality to pull over so we found an open sugar cane field and pulled up there. And Mum with regards to what we were chatting about eating the sugar cane alongside the road I did try one! LOL the ones on the road we just to unappetising to eat - too many cars had run over them! The above photo is a view from our seats - not sure what range that is. But the Bruce highway followed alongside of it the entire way. The traffic was okay today and since we had a wide shoulder we decided that it was the best day cycling for the past couple of weeks and we both enjoyed it alot. We got to Calen around 2pm and picked up a loaf of bread at the general store/newsagency. I didn't go in but Neil did and it is run by an 85 year old woman who is very good at adding up without a cash register or calculator and writes the docket for each purchase on scrap paper! The tax dept would love her! Below is a photo of the store and inside Neil said there is just absolutely boxes of everything imaginable! As soon as we got to the camp ground we remembered that we camped her last time. It is small and pleasant and we camped under a lovely tree with these nice flowers on them. It was even colder last night - but I suppose because the days are so bright and clear that means the nights will be cold - but we were all warm in the tent - we don't mind the cold nights as long as the days are warm and this morning it was bitterly cold but once in the sun you soon warmed up! 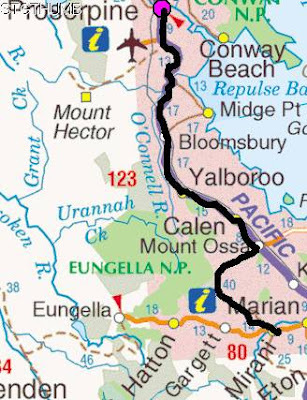 We cycled along the Bruce highway for around 6km before we said bye to it and turned to go west and past Eungella national park region. I knew that the bulk of today was going to be in the hills since you go past a national park and usually a national park is all the hills and mountains that can't be used for farming or grazing!!! As soon as we got of the highway we immediately noticed the quietness and lack of cars - especially trucks! While along this quiet road we may have had a total of less than 10 cars pass us to Mt Charleston and after that maybe 20 to Mirani! It was fantastic - very hilly and undulating but we didn't seem to mind that we both felt good in the legs - it was just pleasant cycling all day! the above photo is the type of country we were cycling through and it is nothing but either grazing or sugar cane fields - predominantly sugar cane. Like I said it is very undulating with more climbing than going down. The road was okay to Mt Charleston (at 22km point) but after that it became a one lane road and at times 2 lanes when going around a corner. Not too many caravans use it (we did see a few) I suppose because of the narrow road but it is so picturesque! above - a typical undulation! ... and we are still climbing - we did pull over for a cuppa at this point and not one car passed through over the 20mins! It was just so quiet there! At around the 29km point you sort of go down a small hill and onto the plains and it is relatively flat all the way to Mirani and Eungella is to your right as you ride along. Below is a photo of the range (the small one in the front not the bigger one at the back!) we just came over! and below is a photo of where we are about to go! 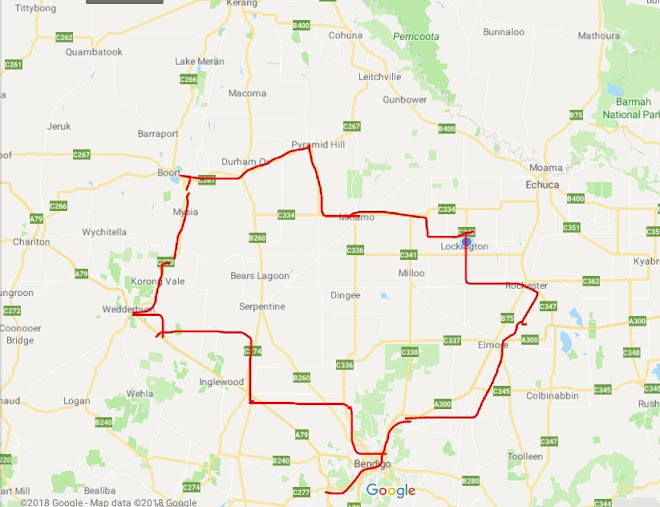 so as you can see it is relatively flat for the final 18km to Mirani. It is a small town on the road to Eungella national park. The caravan park (council) is full mainly with people that have picked up work in the region for a while - so we think it will be quiet tonight? It does have a covered bbq area and a hot/cold water tap at the sink to do dishes and some power points which I am using at the moment. Not too sure when the caretaker will come to collect fees - there is really no information when you come in ... Neil is hoping we get to stay for free! We head for Nebo tomorrow and so most of our day will be cycling through the cane fields and our view will be a bit like the photo below! It will be cold again tonight as the day has been very clear - it was a hot sun when standing in it but okay while riding as you create a sort of breeze as you ride along. Below is a bus that is not far from our tent - I like the outback mural on it - it has Northern Territory number plates. I can see from the tent that it has a full kitchen fridge and more than likely it is fully equipped with everything! Tomorrow we will start our 3 and 1/2 day ride to Dysart - so 3 nights in the bush and 3 nights without a shower! should be there on Tuesday.